Our first encounter with kamishibai occurred over thirty years ago when MARGARET EISENSTADT was teaching at an elementary school on a U.S. Air Force station in Japan. After MARGARET returned to the U.S.A. with her collection of kamishibai stories, she used them in day care centers and elementary schools in New York City. Her students, who came from diverse cultures and economic circumstances, all loved kamishibai. MARGARET'S dream was to make these stories available one day to educators through-out America. DONNA TAMAKI and MARGARET had been graduate school classmates. DONNA became the other half of Kamishibai for Kids when Margaret asked her to translate the stories into English. 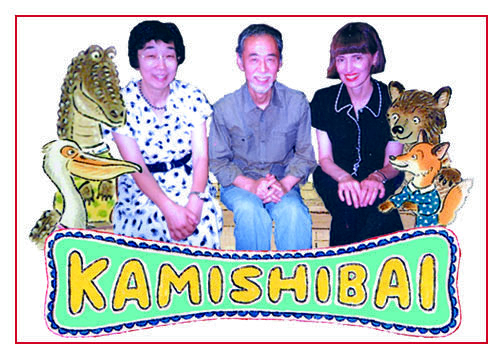 In 1992, with permission from Doshinsha, the Japanese publisher of the original kamishibai stories, Kamishibai for Kids was born. Now our kamishibai can be found in all 50 states and several other countries. They are loved by children, educators, parents - everyone who comes to know them! EIGORO FUTAMATA is a noted Japanese illustrator of children's books and Kamishibai and was a pioneer in the Japanese movement to introduce kamishibai into educational settings. He is a recipient of the first Japan Picture Book Award, and his Kamishibai illustrations for The Three Magic Charms won the Gozan Prize. MR. FUTAMATA is considered a master illustrator and has done the drawings for many other Kamishibai for Kids selections, including Momotaro, The Peach Boy, Little Chick, The Old Man and the Fox, The Oni Who Sank to the Bottom of the Sea, and Kon and Pon. He is loved especially for his illustrations of animals and traditional folktales. He has graciously done the artwork for the Kamishibai for Kids brochures and website since our beginnings and has also created the unique illustrations for our Asian Zodiac Postcards. MR. FUTAMATA collects antique furniture and is an enthusiastic fan of American professional basketball and football.